Review of Joachim Negel and Karl Pinggéra, eds., Urkatastrophe. 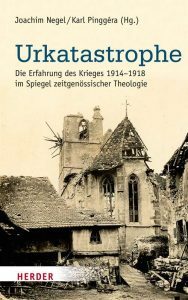 Die Erfahrung des Krieges 1914-1918 im Spiegel zeitgenössischer Theologie (Freiburg: Herder, 2016). Pp. 540. ISBN 9783451328510. The seventeen chapters in this volume are the published version of a lecture series in Marburg (2014/2015) on the impact of the First World War on Christian theology. Collectively, they are global and ecumenical in scope, though there is more emphasis on Europe than other parts of the world, more focus on Germany than other European societies, and more attention given to Protestant than Catholic, Orthodox, or other Christian traditions. They reflect—though in a limited way—broader trends in the historiography of the First World War, which has shifted from a focus on Western and Central Europe toward greater emphasis on international and global dimensions of the war and the experiences and agendas of Asian and African as well as European participants. On the other hand, none of the contributions selected for this volume gives any attention to women who were theologically-trained or pursued religious vocations. Therefore, its assessment of the impact of the war on religious thought remains partial and incomplete. The book begins with two chapters offering broad surveys of early twentieth-century European culture and German war theology, respectively. Elmar Salmann’s “Der Geist der Avantgarde und der Große Krieg” covers familiar territory as it catalogs challenging and unsettling developments in modern psychology, philosophy, art, music, literature, and the natural sciences. For those contemporaries in despair over the complexity and contradictions of modern life, the Great War was a great simplifier and a welcome relief. Wolf-Friedrich Schäufele’s “Der ‘Deutsche Gott’” follows up with an overview of German war theology—also familiar terrain—but Schäufele generates new insights through his side-by-side analysis of Catholic and Protestant war theologies, his recognition of diverse perspectives among theologians of the same confession, and his cost-benefit analysis of contextual theology. In addition to those theologians of both confessions who saw the war as justified self-defense, an occasion for moral and spiritual renewal, or an experience of the sacred, Schäufele draws our attention to Protestant theologians like Reinhold Seeberg and Ferdinand Kattenbusch who believed war was a means by which God tested the ‘Geschichtsfähigkeit’ of nations, a theme that comes up again in Justus Bernhard’s chapter on Emanuel Hirsch (“’Krieg, du bist von Gott’”). Though most German war theology promoted the “civil-religious ideology of German nationalism” (73), Schäufele does not accept Karl Barth’s demand for a radical separation of theology from religious experience. As an alternative, he points to the more nuanced and critical theological engagement with wartime realities that he finds in the works of Rudolf Otto, Karl Holl, Friedrich Niebergall, and Otto Baumgarten. Nine of the chapters that follow offer narrower case studies of individuals representing significant trends in wartime or postwar religious thought. The majority were German Protestant theologians (Karl Barth, Paul Tillich, Reinhold Seeberg, Adolf Deissmann, Adolf von Harnack, Ernst Troeltsch, Emanuel Hirsch), though four German Catholic intellectuals (Erich Przywara, Hugo Ball, Carl Schmitt, Erik Peterson) and one Jewish-German philosopher (Franz Rosenzweig) are also represented. Georg Pfleiderer’s “Kriegszeit und Gottesrreich” challenges some of the origin myths of Dialectical Theology through a close examination of Karl Barth’s “August Experience” (140). Despite Barth’s own claims of an absolute rupture between prewar and postwar theology, Pfleiderer argues that Barth’s intense exchanges with liberal theologians like Adolf von Harnack, Martin Rade, Wilhelm Herrmann, and Friedrich Naumann should be seen as a family quarrel that included moments of understanding and recognition as well as conflict and alienation. Christoph Markschies (“Revanchismus oder Reue?”) also challenges the notion that Barth and Dialectical Theology simply brushed aside an older generation whose systems of thought collapsed in the wake of the “seminal catastrophe” of the twentieth century. He does so through an examination of the postwar works of Reinhold Seeberg, Adolf Deissmann, and Adolf von Harnack, assessing the extent to which they broke from their prewar foundations. Markschies finds very little change in Seeberg’s case, noting continuities between his Grundwahrheiten der christlichen Religion (1902), Grundriss der Dogmatik (1932), and the theology of the German Christian movement—though without fully exploring the final link in that chain. Deissmann remained consistent in the fundamentals of his theology but underwent a significant reorientation in terms of his appraisal of the war and his embrace of the ecumenical movement. Harnack stood somewhere in between, but Markschies argues that Marcion (1920) demonstrates a greater awareness of the distance between Christ and culture in Harnack’s postwar theology than is often recognized. Joachim Negel’s study of Erich Przywara (“Nichts ist wirklicher als Gott”) and Barbara Nichtweiß’ analysis of Erik Peterson (“’Der Himmel des Garnisonspfarrers’”) demonstrate that Catholic theologians who lived through the First World War also emphasized the gulf between heaven and earth and between God and humanity. Przywara ultimately concluded that “God, who from beyond this world and its history, entered and vanished into history (kenosis), can only be encountered through its contradictions and catastrophes” (226). Similarly, Peterson’s postwar fable “Der Himmel des Garnisonspfarrers” (1919) was a scathing indictment of pastors and theologians who, by substituting militarism for the teachings of Jesus, conflated heaven and earth, or divine and human agendas. At the end of the story, the “Son of God” (actually Satan in disguise) proclaims, “Look, now everyone is in heaven, everyone in hell!” (400). If there is any comic (or tragi-comic) relief in this book, it is in Bernd Wacker’s account of the complicated relationship between Hugo Ball and Carl Schmitt (“’Die Revolution tagt in Versailles’”). Along with his role in the Dada movement, Ball’s editorship of the anti-war journal Freie Zeitung and his critique of German militarism and authoritarianism in Zur Kritik der deutschen Intelligenz (1919) were anathema to conservative nationalists like Schmitt, who would eventually be known as the “crown jurist of the Third Reich” (304). However, Schmitt was pleasantly surprised by Ball’s Byzantinisches Christentum (1923), which he took as an indication of Ball’s religious and political conversion (he was only half right). Around the same time, Ball wrote a series of relatively positive essays on Schmitt’s political theology for the journal Hochland, but Schmitt began to fear for his own reputation when he learned that Ball planned to release a slightly-revised version of Kritik der deutschen Intelligenz under the new title Die Folgen der Reformation. Ball’s own illusions were shattered when an associate of Schmitt’s who reviewed the book accused him of having spent the war in exile working alongside of other “paid traitors” (341). The relationship ended with each convinced that his own ideas about Germany, the war, and democracy were rooted in Catholic traditions. Although over half of the chapters focus on individual German intellectuals, several explore international dimensions of the war’s impact on Christian theology. Jörg Ernesti’s “Der Vatikan im Ersten Weltkrieg” argues that Benedict XV’s “peace note” was a watershed in the history of the papacy. In the face of almost complete political marginalization, and widely ignored or disparaged by Catholics on both sides, Benedict XV tried to use his moral authority to bend world affairs in the direction of peace and reconciliation, signaling a greater humanitarian agenda and openness to the world on the part of the Vatican. Karl Pinggéra’s chapter on Orthodox theology (“Alte und Neue Wege”) also sees the war as a watershed, through its destructive impact on Christian theology within the Ottoman and Russian Empires. Churches, seminaries, ancient manuscripts, unique forms of religious education, and a majority of the theologians themselves were annihilated in the context of war, genocide, revolution, and civil war in these regions. Liberal reform movements influenced by German Protestant theology and steps toward greater lay leadership were cut off abruptly within the Armenian and Russian Orthodox Churches. Though Orthodox theology continued among émigré theologians in cities like Paris, they tended to define themselves in opposition to “the West,” by which they meant not only the Catholic and Protestant traditions but also centuries of pre-war Orthodox theology they believed had been corrupted by Western influences. Hannelore Müller’s chapter on the World Alliance for Promoting International Friendship through the Churches (“Jenseits von Konfession und Nation”) focuses on the small subset of European and North American Christians who promoted international understanding and the protection of religious and national minorities in the new postwar world order. Yet even here there was ambiguity, as members of the World Alliance occasionally used issues like the rights of religious minorities to advance their own national and religious interests and to bring “civilization through law” to “backward” peoples in the “orient” and other parts of the world (451). The only chapter to fully engage theological developments outside of Europe and North America is Frieder Ludwig’s “Das also ist Christentum?”, which addresses the impact of the European war on churches and missions in Africa and Asia. Even here, the author gives substantial attention to European perspectives before considering Asians and Africans as subjects in their own right. The second half of the chapter offers cross-regional comparisons of anti-colonial resistance led by prophets representing or embodying indigenous gods but influenced by Christian millenarianism (in Uganda and Kenya) as well as Christian resistance leaders like John Chilembwe (Nyasaland) and Garrick Braide (Nigeria). In addition to those who rebelled, there were African Christians who continued to work with European missionaries even as they criticized European political and religious leadership and demanded greater equality. Following a brief nod to Asian elites and theologians (Rabindrath Tagore in India and Liang Qichao and Yu Rizhang in China), Ludwig concludes that the global nature of the war challenged European claims regarding peace, community and Christianity and made contradictions between missionary work and colonial policies more apparent than ever. As a result, it called into question not only the Christian character of Europe, but also the European character of Christianity (511-512). Two other chapters offer reflections on the fate of the Christian churches in light of the catastrophic failures of the early twentieth century. Thomas Ruster (“Krieg gegen die Glaubensbrüder”) poses the question: “Can one still believe a single word from the churches, given their endorsement and affirmation of this war?” (102). After all, “the whole community of the faithful went astray … from the bishops down to the last believing lay persons—and especially the theologians” (105). According to Ruster, the only way forward is to identify the theological errors that led to the churches’ capitulation a century ago, and to develop a more sophisticated theological understanding of ‘principalities and powers’ in the present, in order to avoid aligning the church with systems that bring death rather than life. Roman Siebenrock (“’Gewalt ist kein Name Gottes!’”) revisits the same problems in the final chapter, arguing that when Christians of different countries pray to the same God for victory in war, they not only destroy the unity of the church, but the Christian proclamation as well. Siebenroth wants “Gewalt ist kein Name Gottes” to be an article of faith against which all affairs of the church are measured. If God’s all-powerful nature means not an infinite extension of power in human terms, but something qualitatively different (Incarnation, kenosis), then the church must also renounce power, privilege, and triumphalism. Such prescriptions are appropriate for churches and believers who have placed themselves in the service of destructive institutions and ideologies. On the other hand, they also assume that white, male, European Christianity stood for (and still stands for?) the whole church. How might a theology of “principalities and powers” or concepts like Incarnation and kenosis be understood within a global and more inclusive framework, with our gaze directed toward individuals like Sister Margit Slachta, Pastor John Chilembwe and Dorothy Day as well as Reinhold Seeberg and Emanuel Hirsch?